Since 2007, Sada Mire worked for education and tourism development in Somali heritage. 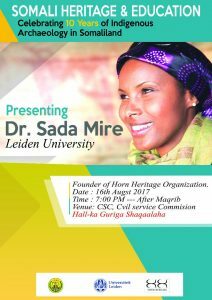 Her efforts in research, publication anddissemination of Somali archaeology and heritage was honoured in Somaliland in August 2017. Mire had the opportunity to celebrate this work with teams she worked with, Somaliland government institutions, NGO, and international and local community, who have contributed to the work. Sada discussed the context of her work and the challenges facing heritage preservation in areas of conflict, as well as her work in Somaliland. Mire and her team’s work in the field has seen many sites rediscovered and their importance revealed to both international and local communities. Dr Sada has made many of her research publications open access. The value of education and preservation was given a wider forum, encouraging Somali students to enrol for her free online course, MOOC on Heritage Under Threat, at the Coursera platform. The Somali heritage needs to be kept alive for future generations.